French demonstrators scuffled with armed police as they await Emmanuel Macron’s visit to Souillac. The town in southwest France has been locked down in anticipation of the presidential visit. Videos circulating on social media shows protesters gathering in front of police who prevent them from passing. 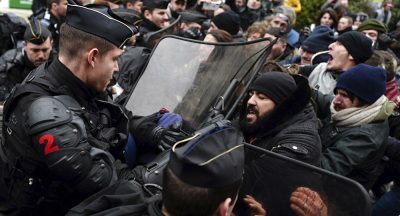 On Boulevard Louis Jean Malvy, demonstrators are seen attempting to shove their way past the line of police, while singing and chanting can be heard as people call for Macron’s resignation. The city has been closed off in a bid to prevent Yellow Vest protests dominating the president’s visit to meet officials. A decree has banned “any demonstration, especially in the context of the movement called yellow vests” for the day, and the town’s weekly market has been closed. Souillac residents can only enter the area if they have a special pass and proof of residence. Police vehicles approached the protesters to get them to retreat, and the majority are now behind a barricade.